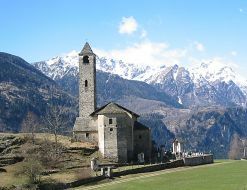 The Strada Alta is a 2-day or 3-day walk along the Valle Leventina in Ticino. It is fairly long in total, but can be split up into any number of shorter sections, and the fact that it follows the valley means that it's not continually climbing over steep ridges or high passes. Conversely, however, it doesn't explore wild terrain and just follows one single valley, rather than encountering constantly-changing vistas. Its low altitude (and Ticino climate) make it a convenient Autumn or Spring hike though, and a chance to wander through tiny Ticinese villages. And it's always good to link day walks together to cover large distances, either staying overnight at one of the villages along the way, or returning some weeks later to where you finished last time. The best stretches of this walk are around the middle, if you don't want to tackle the whole thing. In the first couple of hours from Airolo, the sight and sound of the highway and railway can be a little off-putting, but the atmosphere soon improves. Also, the final descent to the valley floor, as well as being hard on the knees, is not the best scenery of the trip either, so consider taking the bus to cut this bit out. You can also download this kmz file strada_alta_leventina.kmz to open it in Google Earth or view it in Google Maps in your browser. Or of course you can use programs like Prune to transfer the track to your GPS. The start of the walk is Airolo, which is a fairly major station just south of the Gotthard tunnel towards Ticino. There are then several bus access points along the walk, and train connections at Faido and at the end of the walk in Biasca. (Note that Biasca station is some distance from the centre of the town, follow the signposts South from the town centre). The first day of the walk ends at Faido station (some distance from the centre of Faido itself), which is a smaller station on this same train line between Arth-Goldau and Biasca. From Zurich, there are regular trains in both directions, some of them direct, and some requiring a change in Arth-Goldau. For the first day, you can get a return to Airolo and a single ticket from Faido to Airolo - total cost with halbtax is CHF 40. For the (long) second day as described here, you need a return to Faido, and then a single from Biasca back to Faido - total cost with halbtax is CHF 45. Or use the bus services along the way to go back to Faido. 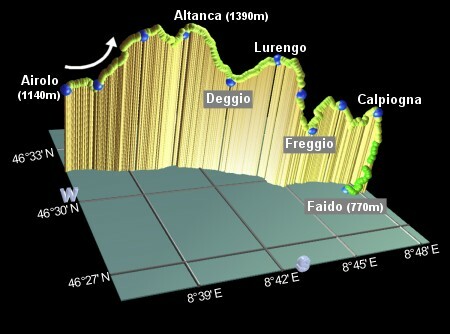 From Zurich, Airolo is about 1h50 away, Faido about 2h10, and Biasca about 2h40. Leaving Airolo station, turn right and follow the signposts for "Strada Alta" up the main street. These signposts prove to be almost entirely faultless for the whole walk, so navigation is not a problem at all. There's almost always a signpost, and on the rare occasions when there isn't, then the route is completely obvious. Continuing to follow the signs, the roads get smaller as they rise up out of the town, and eventually turn into a footpath detouring around a football pitch to reach Madrano after around 20 minutes. The route follows a grassy track for a short distance, before climbing up to meet the road again and following it to Brugnasco. Shortly afterwards, a signposted turnoff takes a short optional detour, taking a wooded trail as an alternative to the road. This trail passes underneath the funicular line, after which the left trail fork brings you back up to meet the road again shortly before Altanca. This trail has a small amount of rooty and possibly slippy steepness, but nothing tricky and the break from road walking provides interest. Those who wish to stick with the 'very easy' rating may wish to keep on the road, however. Shortly after Altanca lies the highest point on this hike, at around 1420m, before dropping down to Deggio (after around 40 minutes) and climbing gently back up to Lurengo (another 40 minutes). Some of these sections are on grassy tracks or paths close to the road, but the route mainly follows the (quiet) road itself. Lurengo marks the approximate half-way point on this walk, and soon afterwards the character changes. Leaving the road, the trail follows a path through the pine forest, and although it might present some mild difficulties, these are well compensated by the change in atmosphere. The path drops steeply through the forest until it reaches a viewpoint after around 40 minutes, with long-ranging views further down the valley to the Southeast. The trail continues to descend, and looking back evidently shows the round bulge of the valley over which you have just climbed. The pine trees help to absorb the sounds from the valley below, as the trail continues down broad agricultural tracks to Freggio, after around half an hour. Climbing up from Freggio, the good views continue along the valley ahead (no airports here!) as the route goes on to Osco after around 40 minutes. Here is an opportunity to shorten the walk by taking the signposted lower trail directly to Faido Staziun, or by taking the rather infrequent bus instead. Or you can continue on the Strada Alta as far as Calpiogna (another 40 minutes), before taking the path down from there. This descent from Calpiogna is quite long, but very pleasant, bringing you to the station after about 45-55 minutes. There are also occasional buses down to Faido, and for the second day of the hike (not necessarily consecutive days! ), the bus can bring you back to where you left off! If you're not continuing directly from the previous day, you will first face the climb back up from Faido station, in the bottom of the valley, back up to join the Strada Alta at Calpiogna. Retracing the descent at the end of day 1, climb up through Piantett and Primadengo, to arrive at Calpiogna after around an hour. Or of course you can see if the infrequent bus can take the strain instead. Now, again following the Strada Alta signposts, take the road out of the village and follow the faint path across the fields. Cross the bridge, and descend to Figgione after around 40 minutes. This stretch is particularly scenic, as you climb up through Muriengo, Rossura and Tengia, before dropping back down to Calonico after around 1h10. 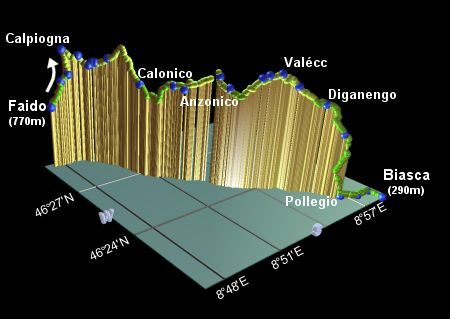 After a further short descent, the route continues more or less level through Lombarda to reach Anzonico after around 1h20. From here there are dramatic views to the right, where the flat plateau opposite lies at the foot of a steep gulley, leading up to the snowy peaks above. As you enter the village, watch out for an ambiguous red-and-white arrow on the wall where the road forks. Take the right fork here to pass through the main street of Anzonico and past the bus stop in the centre. Continue through the village, passing in front of the San Antonio church, climb gently up to Segno, and then drop to Cavagnago after around 50 minutes. The route continues fairly level out of Cavagnago, with some of the best valley scenery of the walk. Shortly it starts to climb once again, passing through Ronzano and Sobrio, to reach Valécc in about an hour. Here there is a picnic spot and playground, with wonderful carved animals and cars (look out for Obelix). 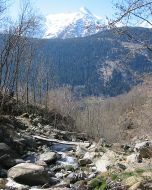 Shortly after Valécc, there is a viewpoint as the valley opens out to show the snowy Italian peaks ahead in the distance. And then begins the long final descent, gradual at first, through Bidre to Diganengo after around 1h20. Then the descent steepens, cutting backwards and forwards in zigzags down the steep valley wall. Because this whole Strada Alta walk follows the valley downwards, this last descent has a long way to drop before it hits the valley floor, much lower than at Airolo or Faido. Unfortunately it also means coming much closer to the traffic, noise and bustle of the busy valley floor as well. In fact, on reaching Pollegio, after around another 1h20 from Diganengo, this is effectively the end of the Strada Alta, because the remaining stretch is purely urban. Now on the floor of the valley, follow the signs to Biasca, leading parallel to the main road to Pasquerio. Continuing in a straight line, you'll soon see the church spires of Biasca, reaching the centre itself in around 40 minutes. From here, the railway station is away to the right, a further 10 minutes walk South from the town centre. There are more walk suggestions in this area at the gruxa.ch strada alta page, and a brief description of the whole Strada Alta in German at leventinaturismo.ch. In the Winter you can also go snowboarding at Airolo.